I absolutely LOVE making tarts. They are simple, delicious and always impress your guests. The beauty is that they are a dessert that can be made ahead of time before a dinner party. One of the tricks to entertaining to have as much prepared ahead of time, so you can actually enjoy your own party. The more organized you are, the more at ease your guests will be and you will have a splendid time. 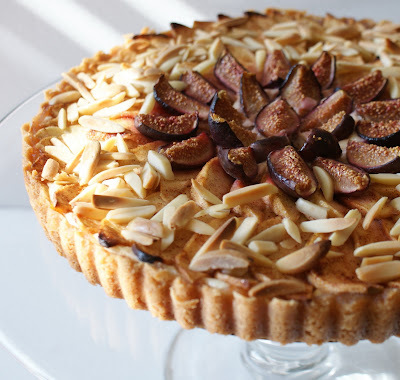 I made this tart for my recent dinner party entitled, “An Evening Celebration of Figs and Friends” where each course celebrated the spectacular fig. Especially this year, I have just been enamored by this jewel of a fruit. It is tasty, versatile and can work with either a sweet or savory dish. This particular tart almost has a cheesecake quality with the cream cheese element in the filling. The crust was buttery and crisp which was perfect with the creamy filling and rich fruit topping. You could certainly substitute the fig and apple for other fruit toppings such as pears with dates. Would love to hear about your favorite tart that you enjoy. Make the crust: Cream the butter and sugar. Stir in the vanilla. Then, mix in the flour to make a smooth dough. Press into the bottom of an 9 - inch springform pan, giving it about a 1-inch rim. Bake 15 minute, or until lightly golden. Remove the tart shell from the oven. Make the filling: beat together the cream cheese, sugar, egg and vanilla for the cream filling until smooth. Make the topping by tossing the apple slices with the cinnamon, sugar, and nuts. Cut the figs into quarter or eights. Remove the tart shell from the oven. Spread over the cream mixture. Arrange the apple slices on top, and place the figs toward the center and swirl around and then scatter over the nuts. Bake until the apples are tender and golden, about 40 minutes. My favorite tart is with pastry cream and fresh strawberries but your could totally become my new favorite! not all tarts are as impressive and appetizing as yours! what a great combination--well done, lisa! Wonderful tart, beautiful tart...as you can tell, I just like saying "tart"! Yummmmmm! This looks delicious. Can I tell you something? I've never tried making a tart before. But I just worked up the nerve to ask a sort of "keep to herself" neighbor if I could pick the apples off her tree and she said yes! I'm so excited and wondering if maybe this tart might be the perfect thing to make with them. Looks delicious! mmmm... yum! I love tarts, too, for exactly the same reasons you cite, and this tart looks fab. I must try out that cream cheese filling! Lisa...what a fabulous dessert. This tart not only sounds delicious, but it looks stunning! I can't imagine a prettier centerpiece to an evening meal. I adore apple tarts...I made a class French apple tart a few months ago, and it was simply delicious! I never would have thought to combine apples with figs, but your tart looks delicious so I'm guessing the combination is excellent. I love the combination of apples and figs in a tart! This looks so pretty and delicious! That looks de-lish! Gosh, there are so many yummy things to make and so little time. Argh! My favorite tart is a savory one -- roasted cauliflower and goat cheese. It's earthy, ooey-gooey, and Fall-ish for sure. Delightful! This is a perfect tart! I just made a rustic apple tart this evening. They are so good with the cooler temps. Gorgeous -- looks perfect for fall! can mascarpone be used instead of the cream cheese and if so how would it change the tart? I am getting ready to bake and don't have the cream cheese but do have mascarpone in the fridge. This tart looks delicious I cant wait to taste it.